Driving down into the flats off of Chuckanut on a sunny day, skirting around Samish Bay, and landing in Edison is one of my favorite local day trips. 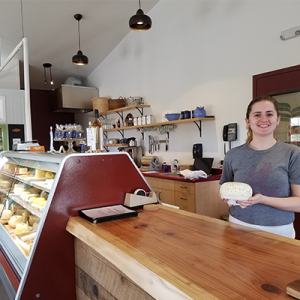 Even better is when I get to stop in at Samish Bay Cheese, one of our most well-loved local creameries. Suzanne and Roger Wechsler have been operating their farm since 1999, churning out Goudas, cheddar, and Montasio cheese from the start, and over time, branching out into the delicious array we know today – yogurts, kefir, fresh cheeses like Feta and Queso Diabolo, and an expanded variety of aged cheeses. A friendly cafe employee showing us some of their fresh cheese. Many of the materials used for making the cafe were reclaimed or local. Smith and Vallee made the beautiful solid wood counter you see here! Recently though, they’ve been making big changes to the farm itself. 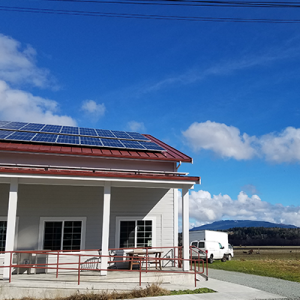 When you roll into Samish Bay Cheese you’re now visiting a dairy, a pastured beef and pork farm, a bed & breakfast, a creamery, and a cafe. Some have been a part of their operations for a long time – like raising beef and pork, some have gotten a recent makeover – like the creamery, and some are brand new – like the cafe! The cafe space is beautiful and cozy, you can buy all of their products or sit and relax – enjoy some local wine, roasted coffee, ice cream or tasty treats. All of it is an amazing accomplishment, made even more so by the fact that when the couple started the farm they didn’t have any previous dairy experience! They had however, been a part of the food industry for a long time, Roger and Suzanne were originally both pioneers in the natural and organic food movement in the early 70s, Roger being the first manager of the Capitol Hill Co-op – now the Central Co-op in Seattle. Looking for a quieter life, Roger moved North in the early 80s and Suzanne followed shortly after – it was that drive through the flats that hooked her! Roger had started growing mixed vegetables on land he bought, but when the dairy came up for sale shortly after they settled, they saw it as a great opportunity to invest in something larger. 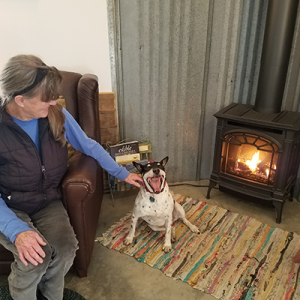 Charlie’s favorite spot inside the cafe – right in front of the fireplace! And they were! They started selling at a variety of local farmers markets their first year, including Pike Place in Seattle and began branching into new business models as soon as it became clear it would be beneficial to the farm and their business practices. For example, they had an excess of whey leftover from the cheese making process, rather than throwing it away they realized it would be perfect feed for pastured pork. Steers born were also kept and raised for grass-fed beef. They rotate the cows around their 180 acres to keep pasture in prime condition and continue to look for ways to make their farm more sustainable. On the new production building and barn roof, they’ve installed a large solar array to offset electricity use (163 panels to be exact)! A portion of the solar array atop the new production facility, there is a great little picnic spot on the deck to enjoy cafe treats or cheese when the weather is nice. The new production building is impressive (check out the virtual tour below) and has made Roger and all of their cheesemakers incredibly happy. The old creamery, though well loved, could only fit 6 or so people inside of it and given that they make 25 different kinds of cheese, on top of their different yogurts and kefirs, it was quite a squeeze. They now have ample room to do what they do best – make incredible organic dairy products. There is a fun self-guided tour of the entire farm you can take yourself on the next time you visit, keep an eye out for their official greeter Charlie the Cheese Dog! Right before I left Roger shared some of the pork he had been carefully smoking all morning, with a homemade dry rub it was some of the best BBQ I’ve ever tasted; it was the first sunny day we had had in a week and being outside, chatting about the farm and getting to visit with Roger, Suzanne and Charlie felt like a slice of heaven – it was hard to leave! I’ll definitely be making some spring and summer trips down again and hope you will too! Look for their cheese at our local grocers and local farmers markets. Find all their contact information in our local business directory!